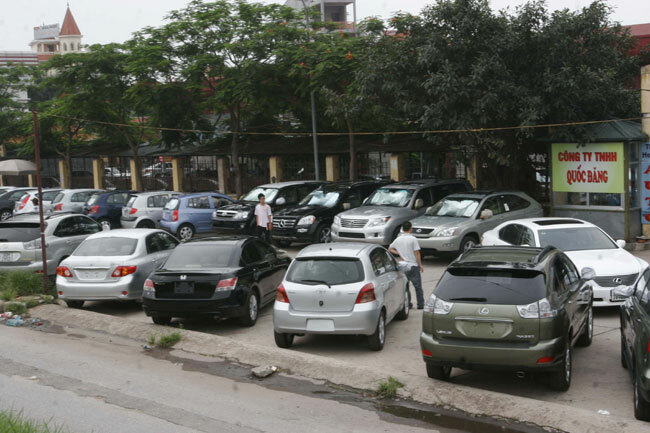 HA NOI (VNS) — The domestic automobile industry faces the risk of collapse, with both consumers and manufacturers shifting to imports, according to the Tuoi tre (Youth) newspaper. A resident of Ha Noi's Cau Giay District said he had decided to spend more than VND600 million (US$28,570) on a five-seat Mitsubishi Attrage CVT, which is imported from Thailand, despite studying domestically-assembled sedans. "After testing several domestic cars my friends own, I believe this imported one is more comfortable...and its price is quite reasonable," the unnamed motorist added. Imported cars have reportedly attracted more buyers recently, thanks to their better quality. In particular, the number of vehicles from Thailand is increasing, given the variety of categories and advantages related to import duties that they offer. Grasping this trend in the last year, some manufacturers gradually shifted from assembling to importing cars. Vina Star Motors (VSM), a joint venture of Vietnamese, Japanese and Malaysian firms in the southern province of Binh Duong and a sole distributor of Mitsubishi vehicles in Viet Nam, is one such example. General Director of VSM Kazuhiro Yamana told Tuoi tre that the company's plant in HCM City's Hiep Binh Chanh District now focuses only on assembling the Pajero Sport, rolling out about 100 vehicles per month, whereas this workshop used to manufacture 410 units every month. In the last fiscal year, between April 2014 and March 2015, VSM sold 2,530 vehicles of different kinds, with as many as 1,660 autos imported from Thailand and Japan. "Although the total sales reflect only around 80 per cent of our target, the figure rose by 59 per cent from the previous fiscal year," Yamana pointed out. VSM has reportedly imported the most number of completely built units (CBUs) among members of the Viet Nam Automobile Manufacturers' Association (VAMA). Yamana noted that his company had carefully considered importing either CBUs or completely knocked down items for domestic assembly, with the latter having minimised costs for consumers. Moreover, General Director of Toyota Viet Nam Yoshihisa Maruta said in a meeting earlier this month that his company now "stands at a crossroad", as it will also have to choose between maintaining production or shifting to imports, taking into account that tariffs on CBU imports in Southeast Asia will be zero per cent in the next three years. In addition, the VAMA revealed that it was unaware of what support policies the Government will take to help automakers continue with their manufacturing operations. According to the calculations of members of the association, car prices in Viet Nam are some 2.5 times higher than those in other ASEAN member states due to tax-related reasons, and this reduces the competitiveness of domestically-assembled vehicles. Special consumption taxes alone have caused prices of the assembled cars to cost at least 5 per cent higher than those of CBUs, Yamana revealed. At a conference held in Ha Noi on April 9, Chairman of the Viet Nam Association of Foreign Invested Enterprises, Nguyen Mai, suggested a reduction in import taxes imposed on car components be offered. "If these taxes are not lowered, Toyota and several other automobile enterprises will certainly have to turn to imports in the future. They will not be fools by continuing to import components for assembly," he remarked. According to Mai, Viet Nam has implemented strategies for the automobile industry since 1991, and now manufactures about 120,000 vehicles per year. In comparison, Thailand also began implementing strategies for this sector in 1991, but manufactures about 2.5 million vehicles and exports 1.45 million units every year. Furthermore, sources of Tuoi tre estimated that the average price of five-seat cars imported by Viet Nam from Thailand will fall from $24,750 in 2015 to $16,500 in 2018.